Lead-acid batteries include AGM, VRLA, Gel Cell and Flooded batteries. Lead acid batteries are composed of battery cells. Each battery cell is approximately 2 volts. In most batteries, you can determine the voltage by counting the battery cells. 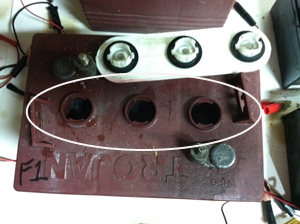 In flooded batteries, each filler cap is a battery cell. In sealed batteries, the caps are sealed. A battery with 3 caps is a 6 volt battery. Now that we know the voltage of the batteries, we can now determine the voltage of the system. Golf Carts: Count the number of batteries and multiply by the voltage. 6 x 6 volt batteries is a 36 volt system. Other systems: To determine the total voltage of a battery system, you first must determine how the system is connected. Battery systems are either connected in series or in parallel. 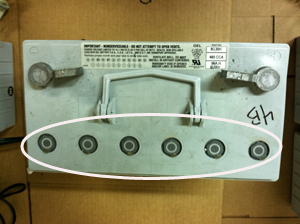 First, observe the connections between the batteries. Series connected battery systems are connected from the positive (+) terminal of one battery to the negative (-) terminal of the next battery, or vice-versa. 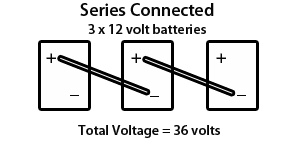 To get the total voltage of a series connected battery system, multiply the number of batteries by the voltage. 3 x 12 volt batteries connected in series is a 36 volt system. Parallel connected battery systems are connected from the positive (+) terminal of one battery to the positive (+) terminal of the next battery as well as the negative (-) terminal of the same battery to the negative (-) terminal of the next battery. The total voltage of a parallel connected battery system is the voltage of one battery. 3 x 12 volt batteries connected in parallel is a 12 volt battery system.